A hundred years ago, the bodies of many cars were made of wood. As steel eventually replaced wood, not everyone was convinced of its higher strength and safety. Those who missed the "woodie" were comforted by the woodgrain-paneled look, now an appearance package rather than a product of the actual materials used. In some models - mostly wagons and minivans - the look would last for more than forty years. This is but one instance of skeuomorphism, a term which refers to the fashioning of artifacts in a form which is more appropriate to another medium. Archeologists often use it to explain the existence of otherwise inexplicable objects. Some of those might be the fake copper rivets on jeans, long made obsolete by modern stitching. Radiator grilles on electric cars. Plastic hair combs dyed to look like tortoiseshell. A camera phone which emits a shutter-click sound. A modern sports car which must meet noise regulations, but pipes in racy sounds through its speakers to console its driver. Perhaps the most obvious example of skeuomorphism could have been found on our computer, tablet, and mobile-phone screens - with very few exceptions, up until a few years ago. Back in 1984, the Apple Macintosh graphical user interface was a thoroughly new concept in personal computing. The Mac allowed you to open files and applications by pointing and clicking; to scroll through documents, and to drag and drop items to gather them together, or delete them entirely. It was a sea change from the cryptic, intimidating C:\> DOS prompt. Steve Jobs was out to prove that everyone could use a computer. Things had to be as intuitive as possible. In Jobs' vision, this called for familiar sights and sounds: folders, drawers, notepads, and - of course - the trash can. These objects and more became icons, important little keys to usability and intuitive navigation. Much of this was copied by Microsoft, for Windows 3.0 (1990). To be fair, Apple itself had drawn inspiration from Xerox PARC. Either way, skeuomorphism was well on its way. As processor power increased and memory became cheaper, the special effects demanded by gel-like controls and metal-like components were easier to achieve. When Apple's glass-like Mac OS X, the first complete revision of the Macintosh operating system, debuted at the turn of the Millennium, color, depth, translucence, and complex textures were fully in evidence. At its introduction, Steve Jobs noted that "one of the design goals was that when you saw it, you wanted to lick it." Windows Vista (2006) had its own glass-inspired theme, known as "Aero," and this continued into Windows 7 (2009). The iPhone (2007) brought a particularly grand sort of skeuomorphism to mobile devices, with a leather-bound calendar, brushed chrome, and a bookshelf finished in gleaming wood veneer. These touches continued with the introduction of the iPad (2010). 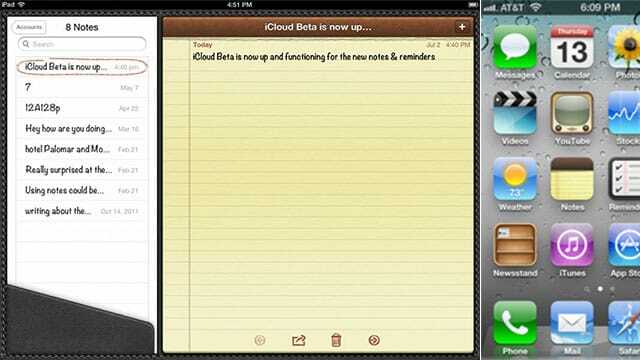 "One of the first things I loved about my first iPad was the native Notes application," wrote Joel Mathis for Macworld. "Notes was more than utilitarian... it became apparent that somewhere in the universe, that pad of office paper - virtual as it is - was being carried around in a nice folio, perhaps one made of rich Corinthian leather, with fine stitching all around the edges. "And I had the same thought I might have had about a real folio made of real leather with real stitching: Somebody cared enough about this to try to make it nice." Apple's premium pricing depends on finding a way to signal that someone has cared enough to make things just right. Indeed, Steve Jobs used to say that the details mattered. Emulating the aesthetic of physical objects on a two-dimensional screen was time consuming, but the effort required to get the textures and shadows right fit Jobs' design philosophy perfectly; it was worth taking the time, he urged. It is said that, with Jobs' death in 2011, senior vice-president of the mobile iOS operating software, Scott Forstall, was not long for Apple. His love for skeuomorphism contrasted with hardware design boss' Jonathan Ive's striving for simplicity. In a reversal of the '80s, Microsoft was providing the impetus for change. Windows 8 would launch in 2012 with a deliberately flatter, solid-colored desktop design. Without the ornamental features of old, it purported to make better use of limited screen area. Simplicity, Ive protested as he replaced Forstall, was emphatically not simple. "Our goal is to try to bring a calm and simplicity to what are incredibly complex problems so that you're not aware really of the solution; you're not aware of how hard the problem was that was eventually solved," he told Britain's Telegraph. The following year, Apple's iOS 7, unveiled in 2013, took delight in repudiating its predecessors. "Absolutely no cows were harmed in the making of this calendar," mused software engineering vice-president Craig Federighi, adding "Look! Even without all that stitching, everything just stays in place." It's fair to say that flat UI design is less time consuming to produce, and that it is less likely to suffer from major faux-pas at the hands of amateur designers. But there's bad flat UI design, too; where buttons look like labels, links aren't obvious, and the design generally gets out of the way too much. Even good Flat UI design can lack contrast and texture. It tends to be a clinical experience. Those who agree would suggest that to ask why a digital calendar needs a coiled-wire hinge on screen is to miss the point. Skeuomorphic design is more vivid, and can seem warmer. It's the equivalent of a modern kitchen compared with your grandma's at Thanksgiving. And didn't everyone go to grandma's precisely because of the effort she put into making everything just right? Mind you, skeumorphism isn't entirely dead. Concluded Joel Mathis for Macworld four years ago, "It's interesting to note that one of the most anticipated new features of the new iOS is a parallax view of the home screen, which lets a background image move around slightly while icons remain in place above it. "It's a trick that enhances the user's sense that the world behind the glass is real, three-dimensional, something to be actually grasped."